If you have kids, you probably have crayons. Pretty soon, if you’re like us, you have a ton of crayons taking up space. Just what do you do with all those old crayons? 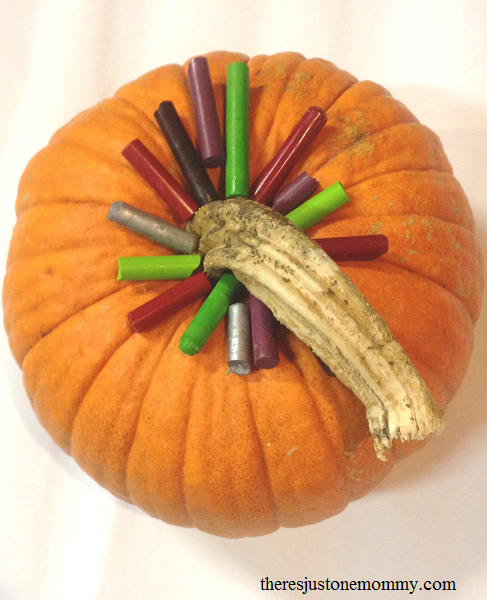 We had fun using our old crayons in this no-carve pumpkin idea, making colorful Crayon Drip Pumpkins! It’s one of our favorite Halloween crafts & activities for kids. Look through your old crayons and find the colors you want to use for decorating your pumpkin. The paper will need to be peeled from each crayon before you can use them. 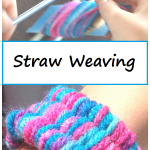 This is a great way for kids to work on fine motor skills! If you have a small pumpkin you may want to break crayons into smaller pieces, as you won’t need as much wax to drip down the pumpkin’s sides. For larger pumpkins keep the crayons whole. Then, arrange the crayons on top of the pumpkin, as shown below. Our pumpkins all seemed to have a nice flat area on top where the crayons rested without rolling. If you have a tall, narrow pumpkin, or your crayons don’t want to stay in place, you could use a bit of craft glue to glue them to the pumpkin. If you do this, you will need to wait for the glue to dry before you proceed to the next step. We found that it worked best to do one section of the pumpkin at a time, concentrating the hot air on about 1/3 of the crayons, and then moving to the next group once those were melted. The kids loved watching as the colors melted and swirled together! If your pumpkin has a deep indention where the stem is you will need to angle your hair dryer so it blows the melted wax down the pumpkin’s sides instead of letting all the wax pool around the stem. Want your wax to stick to the pumpkin as it curves towards the bottom, instead of it hanging straight down? Use the hair dryer and angle it at the bottom of the pumpkin’s sides while tilting the pumpkin a bit. The results are colorful, unique pumpkins to display! Not happy how it turned out? 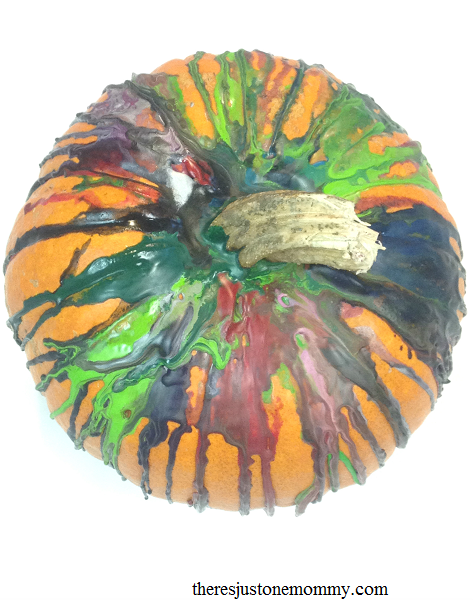 You can always add more crayons to the top of the pumpkin to add more color. We did this pumpkin with two different sets of crayons, adding more greens the second time around. Metallic crayons (like silver) give the pumpkin a really neat look. Using only red and black crayons gives the pumpkin a very Halloween feel, looking a lot like blood dripping down the sides. You will want more than one pumpkin to do this with, as it can become very addicting! Make sure you place your pumpkin on some old newspapers, drop cloth, or something else you don’t mind getting a bit of wax on because the wax will drip off the pumpkin a bit. If placing your pumpkin outside, try to put it in a spot that isn’t going to have sunlight the whole day. (We discovered the wax will melt a bit if you leave it too long in the sun! 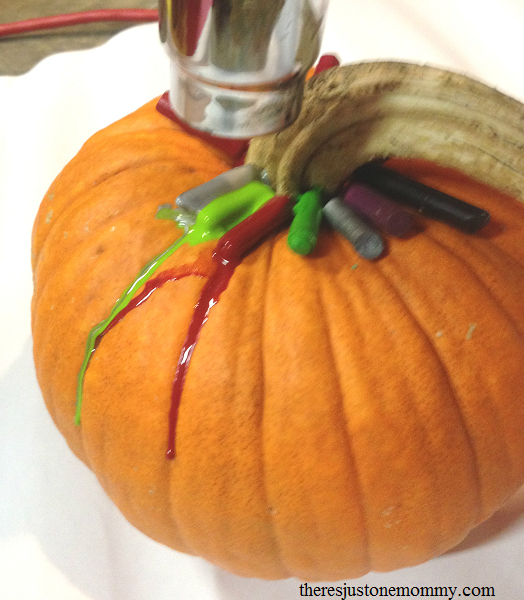 Finally, there’s a fun and creative use for those old crayons this fall — make crayon drip pumpkins! I guarantee this no-carve pumpkin idea will be a hit. Pumpkin Sink or Float Experiment — Do pumpkins float or sink? Find out with this simple experiment and then take a look inside the pumpkin to determine why. Make a Pumpkin Volcano — Give a classic science experiment a fun, fall twist. Hammering Nails in Pumpkins — This is always a huge hit. (Pun intended.) 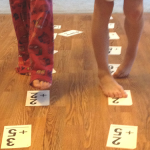 And it is perfect for getting that needed proprioceptive input, too. Pop-Up Pumpkin — Toddlers and preschoolers will love this cute craft. I bet she would love watching the colors swirl together! 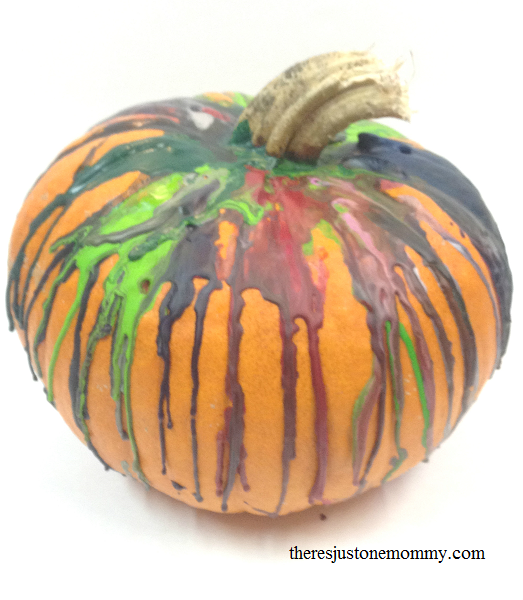 These crayon melted pumpkins are really fun! I was wondering how to melt the crayons. I pinned to try with the kids as soon as we get our pumpkins. 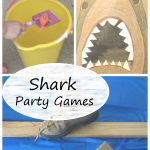 I would love for you to come by Made for Kids link party and add this. I hope they have as much fun making them as we have! Thanks for linking them up! I’m sure they will have a blast! I HATE carving pumpkins – the smell, the mess – YUCK! This is such a great alternative! Especially for little ones who can’t be trusted with a knife! Yes, those would be perfect! 🙂 Have fun decorating pumpkins. Bar none, this is the most creative pumpkin I’ve ever seen! And no one can ever copy it exactly! Woo hoo for unique! 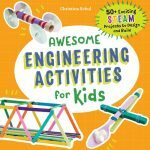 What a fun activity! I’m always looking for alternative way to decorate our pumpkins so we don’t have to carve them. Thank you for sharing at the #Made4Kids Link Up! I’m TOTALLY doing this!! I just LOVE this idea! Thank you so much for sharing it, my friend!!! Love decorative pumpkins. This is the coolest idea! Pinned, stumbled, tweeted AND selected your post as my Editor’s Pick for the next Wonderful WEdnesday Blog Hop on Ducks ‘n a Row! We start Tuesday evenings at 7pm ET. Hope to see you there. Looking forward to hoping over your way again! I love how colourful these are! Thank you for joining in with the Frugal Family Linky this week! Sounds good! I’ve given up on melting crayons though. They just don’t!